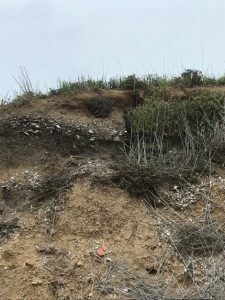 During our undergraduate years at Penn State (2013-2014), we worked in the Zooarchaeology labs sorting shell midden assemblages from the California Channel Islands. The project was a part of Dr. Christopher Jazwa’s dissertation, which involved studying how patterns of human settlement, subsistence, and mobility were influenced by the changing environment and cultural factors. Five years later, we were lucky enough to receive an invite from Dr. Jazwa to participate in a week-long survey on Santa Rosa Island. The goals of the project were to survey new areas of the island, primarily the interior, to identify and record new archaeological sites for the National Park Service (NPS). 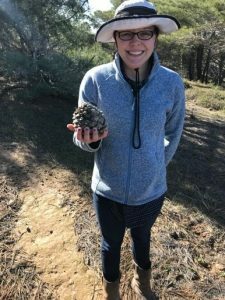 Our team consisted of four members: Ourselves, Dr. Jazwa, and Kirk Schmitz (a master’s student at the University of Nevada, Reno). View of faunal remains in the Observation PitOn our first day in Los Angeles, we visited the La Brea Tar Pits and its associated museum. The La Brea Tar Pits are located in central Los Angeles, and the world’s most famous Ice Age fossil active excavation site. The museum included a park, which contained sculptures of Ice Age animals, a Pleistocene garden, and ongoing excavations of the tar pits, as well as the George C. Page museum. The museum contains fossils excavated from pits, some dating back to the earliest excavation in 1915. The museum contained a fossil lab (called the “Fish Bowl”) that allowed visitors to view the scientists and volunteers in their ‘natural environment’ while they worked to remove tar from the fossilized remains. 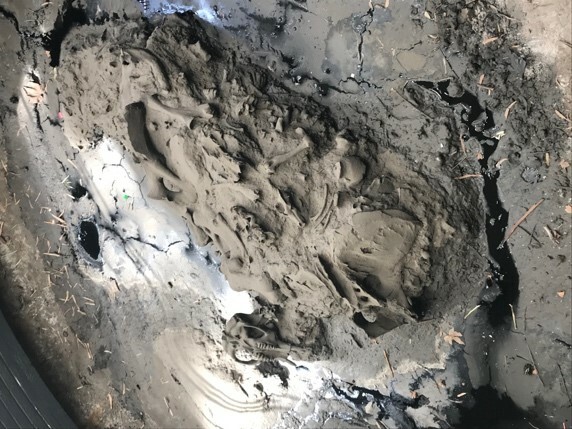 For us, the coolest part of the La Brea Tar Pits was the Observation Pit, which allowed us to get up close and personal with an active tar pit that still housed the remains of extinct Ice Age animals. 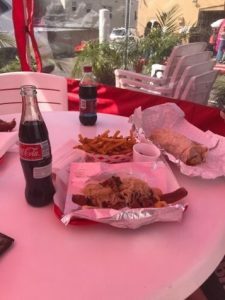 After La Brea, we visited Pink’s Hot Dogs in Hollywood to eat some of the most ridiculous hot dogs humans have ever made. The portions were so enormous that it put us into a food coma, allowing us to rest for our trip to the island the following day. Waking up early is not our thing. Thankfully the jet lag made our 6 A.M. wake-up call much easier. After loading up our gear and supplies into “the Wagon” (as Dr. Jazwa calls it) we departed to the docks in Ventura, Ca. We boarded the Ocean Ranger, a boat owned by the NPS, and we departed on our 3 hour ride to Santa Rosa (Gilligan’s Island anyone??). We arrived at the Santa Rosa dock in the early afternoon and quickly took our belongs up to the park housing. 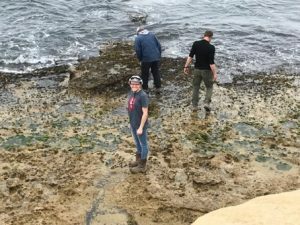 Our first order of business was to travel to the south side of Santa Rosa to collect mussels from the intertidal zone that would be used for isotopic testing…and dinner! The collection process was not as easy as we would have envisioned, since the tide was relatively high that day. Despite taking some unwanted dips in the Pacific Ocean, we were able to collect our sample (approximately 50 mussels and 20 turban snails) and returned back to housing. Unbeknownst to us, Dr. Jazwa apparently also has his Ph. D. in the culinary arts (not really), as this was the first of many amazing meals he cooked for us during our stay. Day 3+4: Rain, Rain, Go Away! Our survey got off to a slow start. During the first 3 days we were on Santa Rosa, the island received more rain than it had all year! 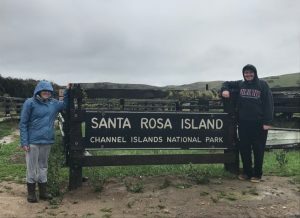 Santa Rosa is primarily made up of sandstone rock, meaning the roads do not handle water very well, making getting to the survey area impossible. Instead of surveying during these days, Dr. Jazwa gave us a tour of closer sites along the coast. Most of these sites were ones that we had analyzed material from while at PSU. Our tour of the island included visiting the historic ranches, coastal shell midden sites, and Cherry Canyon. 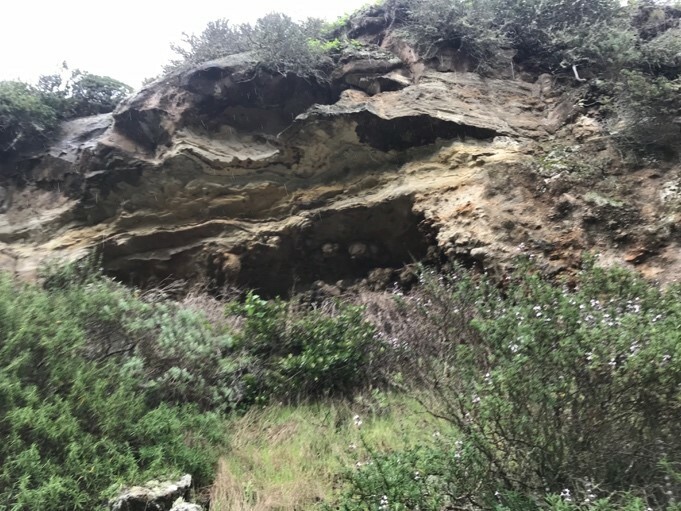 While walking through Cherry Canyon, Dr. Jazwa pointed out the numerous rockshelter sites that have been identified. Day 4: Let the Survey Begin! The rain had ceased and we could finally start our survey! Unfortunately, the roads were still closed due to the rain so we had to hike a few miles to our survey area. The hike was generally nice, except for the stream crossings and climbing over a mountain ridge. The plan for the project was to do a surface survey along ridge tops on the interior of the island to locate possible inland habitation sites. Our luck was good from the start, as we were able to identify and record four sites that day. All four sites contained lithic scatters that were visible on the surface. 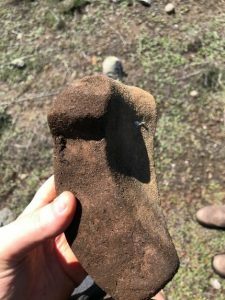 We found some really interesting artifacts at two of the larger sites , such as a volcanic chopper, lithic cores, a part of a sandstone vessel bowl, and a broken projectile point. For each site, we had to record the site boundary and the location of the most significant artifacts using a Trimble. We created a sketch map of these features and took site overview photos, as well as close-ups of the significant artifacts. On our return trip to housing after surveying we walked through one of the only two Torrey Pine stands in the world (the other is a golf course in San Diego). The detour added a couple more miles to our hike, but it was well worth the extra leg pain. We did not have quite as much luck on our second day of survey. 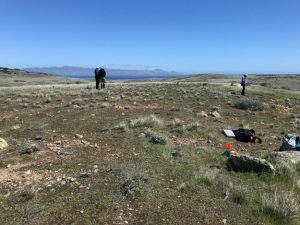 We only located one site, but were able to survey a large swath of land. The site we identified was a large shell midden and lithic scatter adjacent to an old road. 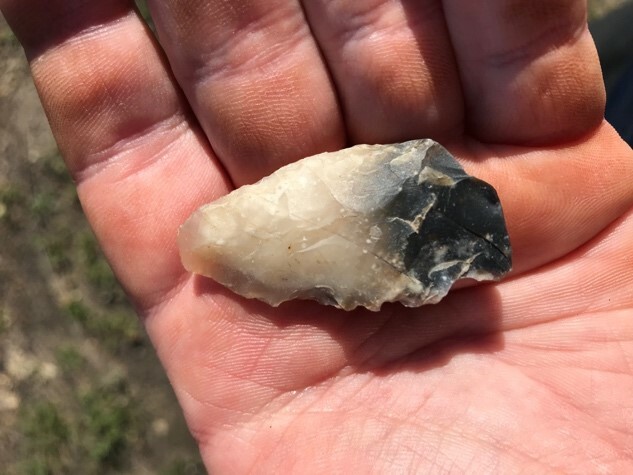 We found an almost complete chalcedony projectile point (lying in the road!) and two possible groundstone artifacts. While we were not able to locate any other sites, we did find three complete skeletons of deer/elk. We learned that deer and elk populations were brought to the island by humans in the mid 1900s, but were fully eradicated by 2017 to preserve the natural state of the island. With our final day of survey in the books, we headed back to housing to prepare for our departure and the end of our vacation. We arrived at the dock about an hour and half before our ride home arrived. We used this time to explore the Carrington Point Marine Reserve and play in the sand. We saw previously identified sites on top of the cliffs, and wandered in coastal caves and rockshelters. An Island Packers boat (equipped with a bar!) picked us and some tourists up to take us back to Ventura. The ocean had some large swells making our return trip exciting or terrifying, depending on how you look at it. We got lucky enough to see some dolphins riding the large waves during the ride, and honestly they were handling the waves better than we were! 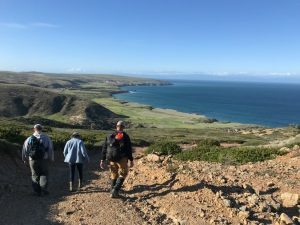 The Packers boat made a short stop at Painted Cave, a large marine cave on the northern side of Santa Cruz Island, and we were able to take some awesome pictures of it. To put a stamp on our trip, we returned to Pink’s (again) before being dropped off at LAX to return to good ole IUP. This project was one of the greatest experiences we have had in our young career in archaeology. We were able to learn a lot of new information about the islands, as well as pick up on some new techniques and methods for doing archaeology. We would like to thank Dr. Jazwa for inviting us to be a part of the project, and our professors for allowing us to go on the trip. We recommend visiting the islands if you are ever in southern California! This entry was posted in California, Channel Islands, Faunal, Fieldwork, Grad School, Labwork, Musings, Pedestrian Survey, Training.